Popular and internationally recognised Indian writer, publicist and publisher. She married Rajiv Gokhale at a very young age. After the wedding she moved to Bombay, where she worked as a journalist. Her first book Paro: Dreams of Passion was released in 1984 and caused much agitation in India because of the brave treatment of the topic of sexuality. The tragic death of her husband put a stamp on her subsequent books. These books include Gods, Graves, and Grandmother (1994), A Himalayan Love Story (1996), Mountain Echoes – Reminiscenes of Kumaoni Women (1994), The Book of Shadows (1999), The Book of Shiva (2000), Shakuntala: The Play of Memory (2005). She is also a co-author of the anthology In Search of Sita (2009) created together with Malashri Lal. 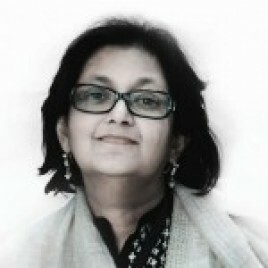 She is the founder and director of the popular Jaipur International Literature Festival. At the 2nd Conrad Festival she took part in the meeting Jaipur morning at the Institute of Oriental Philology of the Jagiellonian University.